Mas Day in New Hope is a mini-scenario for the 2nd edition of Gamma World, published in Polyhedron #15 (Nov 1983, pg 22-23). Polyhedron was bi-monthly at the time, so this was the holiday issue. The scenario was written by the creator of the game, Jim Ward, and thus could be held as official GW content. Around this time Ward had a series of Gamma World articles in Polyhedron; most of these remain obscure due to the low profile and lack of CD archive for Polyhedron as compared to Dragon magazine. "Mas Day arrives and all of the children and cubs of the village are up early and outside playing around the Tree of Life. Your parents and friends are just climbing out of abed when the village is shaken by sonic blasts from an unseen force ... Your vision is drawn to a point just beyond the edge of the village; there to your surprise is a huge man with a white beard, dressed in strange red clothing - flying a large metal chair of the Ancients pulled by eight giant, flying brown creatures". The villagers naturally feel threatened and attack the visitor to little effect. See the artwork above by Jim Holloway illustrating this scene. The man is an X.M.A.S. unit, a deadly Santa robot (long before the one on Futurama), "originally designed to serve in department stores around the world". They are manufactured by a recently awakened robot factory on the glacier-covered mountain, but because Gamma World is so deadly the units keep getting destroyed, and the computer system in charge has heavily modified them to increase offensive and defensive capabilities: "it was made radiation-proof, was designed with battle armor, and was given three different internal weapons systems and two auxiliary laser weapon systems. 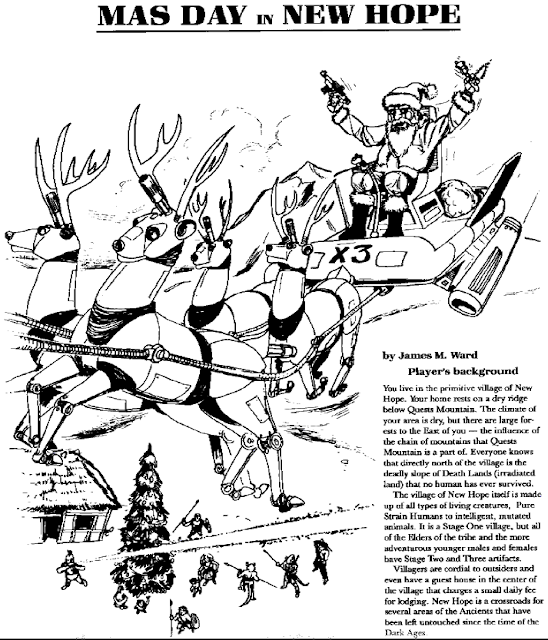 The brown servos [i.e., reindeer] were all enlarged and given mini-missile launchers in their antennae and flame throwers in their tails" and the sleigh (grav sled) was given force fields to protect from everything but large nuclear blasts. Despite the weaponry, unless the assault continues it will "be friendly to all the people of New Hope and give out toys and the like to the kids. It will talk to everyone and ask them what they want and promise to bring it the next year (a promise that cannot be kept)". If you are a fan of Jim Ward's postapocalyptic material, check out his material available for first edition Metamorphosis Alpha available on DriveThruRPG.com, including a nice pdf of the original Metamorphosis Alpha rulebook from 1976 with some bonus material included. And if you missed it, the Greyhawkery blog interviewed Ward about two weeks ago. Over at the Acaeum, Gnat the Beggar posted some images from the June 1982 issue of Game Merchandising magazine, including this charming cover. 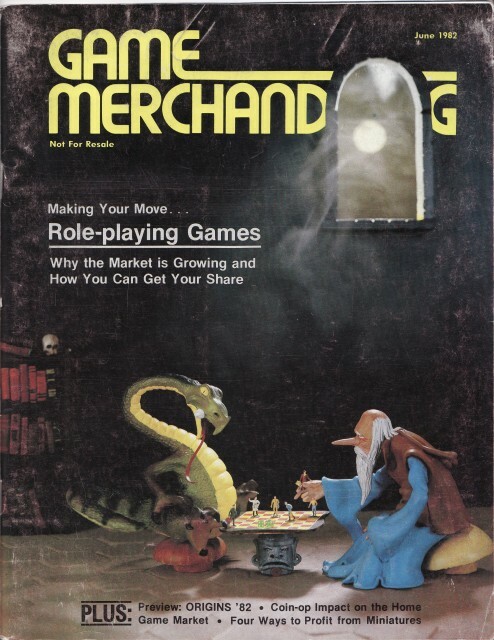 Game Merchandising was a short-lived industry magazine for retailers/industry folks (see the "Not for Resale" on the cover) that existed from around 1981-1983, and earlier was a section of Model Retailer magazine. 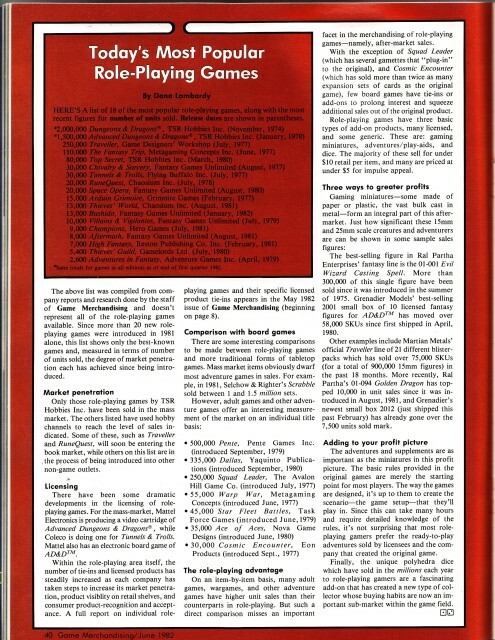 This time period that saw a boom in "gaming magazines", for example Ares (1980-1982, twelve issues), Adventure Gaming (edited by Tim Kask, 13 issues from 1981-1982) and Gameplay (edited by Jake Jaquet, another former Dragon magazine editor, 14 issues 1983-1984). The appearance of these were probably driven by the big sales of D&D during this time period. Another page from this same issue of GM puts the total units of D&D sold through 1982 at 2 million, and total units of AD&D sold at 1.5 million. The figure for D&D undoubtedly includes not only OD&D but also all of the Basic (Holmes and Moldvay) and Expert sets sold through mid-82. No, it's not TSR's answer to the Star Wars Holiday Special. It's part of a "Mapping the Dungeons" column from Strategic Review #5, December 1975, page 7, no author listed (possibly Tim Kask). Here TSR was trying to move some surplus parts. $4 got you an entire OD&D boxed set, minus Vol III. It's unclear how popular this was (probably not very, since the offer is buried in a column part way through the magazine), but no copy of the Holiday Special has been definitively identified (I originally asked about it at the Acaeum in '05). They would be hard to identify since the booklets printings are the same as complete sets and might have Vol III added. Probably would require an owner who remembered ordering this. Today (Dec 20th) would have been my father's 70th birthday. He passed away unexpectedly from a heart attack at age 53. Dad, thanks (among many other things) for owning Lord of the Rings and the surprise DMG from the Exchange. I still have both. Homage: "a show or demonstration of respect or dedication to someone or something, sometimes by simple declaration but often by some more oblique reference, artistic or poetic"
"This game is dedicated to J. Eric Holmes, Frank Mentzer, and Tom Moldvay"
Thanks to jeffb and Azafuse on the OD&D Discussion forums for (respectively) bringing this to my attention and providing the quote. 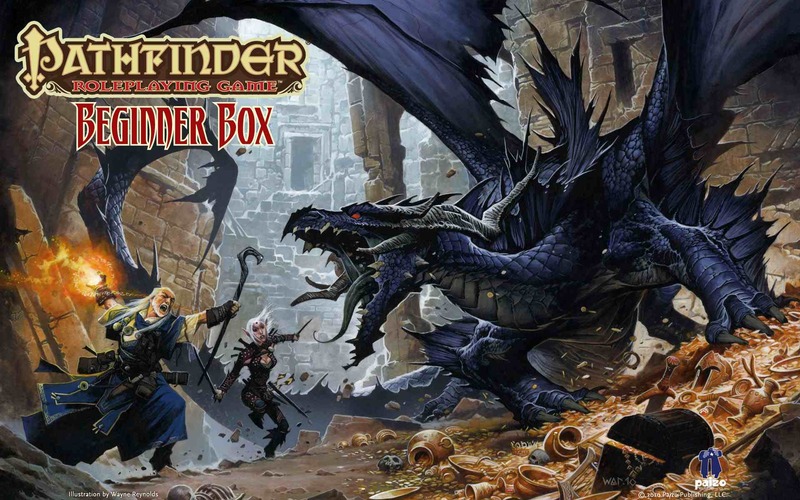 See the thread for further discussion including a link from kesher to a discussion on the Paizo message boards about using the BB with kids. Also, The Society of Torch, Pole and Rope blog has a generally positive review of the set where he writes that "My immediate impression was that of the old Holmes’ basic set". I noticed that the cover art of the BB by Wayne Reynolds features two adventurers, a spellcaster and a warrior, facing off against a dragon sitting on its hoard of gold, including a treasure chest, in a dungeon of cut stone: many of the same elements as the original Basic Set cover art by David Sutherland. The Pathfinder spellcaster's raised fiery hand even mimics the original wizard's raised hand with torch. Click here for a large image provided the BB cover provided by Paizo for use as computer wallpaper. So the BB pays homage to the Holmes Basic Set by both simple declaration (the dedication) and by oblique artistic reference (the cover). In some ways the Beginner Box resembles yet a different TSR Basic Set: the 1991 New, Easy to Master D&D Game designed by Timothy B. Brown and Troy Denning, known colloquially as the Black Box. 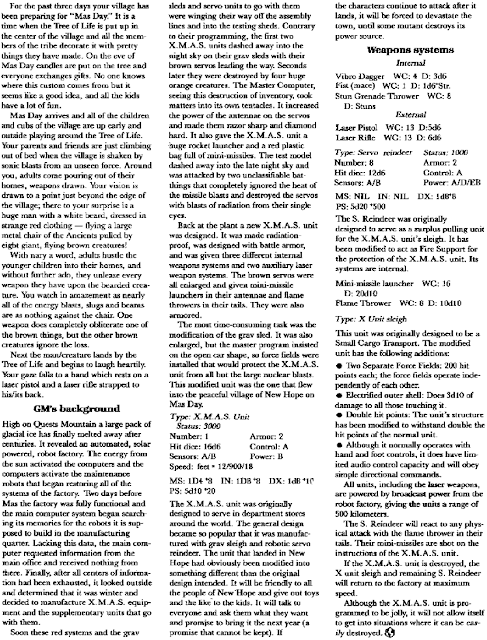 This fourth version of the Basic Set essentially served as an intro for the contemporary Rules Cyclopedia (1991) developed by Aaron Allston. Like the Beginner Box, the Black Box came in a big rectangular box, included a large set of paper minis, and covered character levels 1-5. If anyone finds any other allusions to previous Basic Sets in the Beginner Box, please post them here.
" --a dining room, to which the unseen servants delivered the wh apparently had a decapus in it who attacked as soon as they entered. Here I did a switch. In its original appearance (in B3), PCs enter a room and see a group of men around a table attacking a woman with knives with apparent cannibalistic intent. But this is just an illusion, covering up the actual menace: a ten-tentacled monster who tries to gobble up the intruders. I decided to reverse that: in my dungeon, they saw the decapus, which here itself was an illusion hiding a room full of eight zombies. A secondary motive, besides creating a tough fight, was to throw off anyone who'd figured out which module we were playing (given that one of the players, Steve Winter, was already working for TSR about the time the adventure I was using was published back in '81), which was after all a classic. By throwing in an iconic monster from a different adventure, I thought it might muddy the waters -- and for those who hadn't played the old adventures it work just fine as a stand-on-its-own encounter"
In December 1976, in the lower right quarter of a page otherwise devoted to Tekumel miniatures, Dragon #4 squeezed in an early version of what would become Gygax's Appendix N in the Dungeon Masters Guide three years later. Perhaps this list was intended to provide material for the Christmas lists of readers? All of the authors in this version made it into the DMG list, save Algernon Blackwood, an early 20th-century writer of ghost/weird stories. Specific mention of Lord of Light by Zelazny was also dropped in the DMG. Otherwise, the 1976 list is shorter than the DMG list, missing Bellairs (Face in the Frost was reviewed by Gygax in Dragon #22 in Feb '79), Brown, de Camp solo, Derleth, Dunsany, Norton, Offutt, Pratt solo and Williamson. Around this time Gygax was actively writing to a number of these authors. Tim Kask recently wrote on Dragonsfoot, in response to a question from myself about he came publish Fox's stories, that "Gary corresponded with several authors, including Gar Fox, Fritz Leiber, L Sprague De Camp and Lin Carter, to name just a few. As publisher, he gave me an intro and the rest fell into place. My biggest thrill from that was reprinting Fritz's story [Sea Magic, Dragon #11], closely followed by the original Niall stuff [Gardner Fox, 10 stories between 1976-1981] and a De Camp story [a reprint of the Harold Shea tale The Green Magician, Dragon #15-16]. Here I was, a nobody at a new weird game company, actually publishing writers whose works I had been reading for years. Heady times". Leiber and Fox were also both guests at Gen Con '77. During this time period Gygax was also corresponding with Dr. Holmes, which led to his work editing the Basic Set. The exact chronology is murky but presumably work on the Basic Set was well in progress by late 1976 as it was published during the middle of the following year. Dr. Holmes was a fan of many of the same authors as Gygax, which I can only assume facilitated their collaboration. 1976 saw the publication of Holmes' first novel, The Mahars of Pellucidar, an authorized sequel to Burroughs' inner earth series. On page 41 of the Blue Book, Holmes included a proto-Appendix N, writing "The imaginary universe of Dungeons & Dragons obviously lies not too far from the Middle Earth of J.R.R. Tolkien's great Lord of the Rings trilogy. The D & D universe also impinges on the fantasy worlds of Fritz Leiber, Robert E. Howard, Gardner F. Fox, classical mythology and any other source of inspiration the Dungeon Master wants to use". Anybody want this Holmes Basic Set for Christmas? A few months ago I bought this set on Ebay solely to get an obscure TSR catalog that was included (more on TSR catalogs in the future). I don't need the rest of the set so I thought I'd give it away to a reader of this blog. It's fairly worn but is complete (except for dice) and usable/readable. The box is sturdy but there's one split in the top edge. When I got the set the rulebook (2nd edition, 3rd printing - no prices on the back cover) had the upper right corner of the cover torn off, and the first page was also torn. I repaired these with packing tape. The interior pages have yellowed with age, except for a few in the middle which are mysteriously still bright white. The B1 has a missing upper left corner and some gouges near the spine. As a warning, the box had some loose lead miniatures (not included here) in it when I bought it but I wiped it clean. If you are interested, just post a comment here. I'll randomly pick (dice roll) one commenter to receive the set. I'll cover postage (media mail) for any U.S. address. Update: Since there's interest - shipping to other countries/overseas is fine, too, but I just ask that you cover the difference in shipping by PayPal. I need to give credit to Theodric the Obscure at Mythopoeic Rambling - I appropriated the title of one of his posts for this one. Thanks to all for participating & Merry Christmas. I have some other extras around here so I hope to give away some more stuff during the year next year. Stay tuned. The Collector's Trove is running another set of auctions of items owned by Gary Gygax. The current auctions include a number of TSR promotional posters, intended for display by retailers, including this one for the Holmes Basic Set (16" x 23"). I didn't have a picture of this in my records, so if I've seen it before it was years ago and I'd forgotten about it. The auctions note that all of the posters are double hole punched (once at the top, once 3/4 of the way down), presumably for ease of hanging. An awesome feature of the Basic Set poster is that is shows more of David Sutherland's cover art unobscured. The edges are slightly cropped compared to what can be seen on the sides of the Basic Set, so it's not the full painting, but we see more of the cover without text or bending over the sides. Unfortunately the auction photo is low resolution (the above picture is the full-size of the auction photo). Last year, the Xeveninti blog created an excellent mock-up of Sutherland's original art by scanning the box at high resolution and filling in missing parts. But I'd love to get a larger photo/scan of this poster for the Zenopus Archives site (hint to the winner of the auction or anyone else who might have one of these posters). The auction states the poster is from 1977, and that is the latest copyright date shown, but I think the poster was produced later than that because it has the TSR Wizard Logo, which was started being used in mid-1978. The third printing of the Blue Book from May 1978 still has the Lizard Logo, and first with the Wizard Logo is the 2nd edition, Nov 1978. Also, some of the posters of the same size are for games that came out later, like Top Secret (dated 1980). It's possible they were all produced at different times from 1978-1980 or all at once as late as 1980. The auctions all end in about a day and half (on Sunday the 11th). The Basic Set poster is currently up to $117.50, far beyond what I would pay, but these auctions have a history of going very high due the celebrity factor. "I don't want to put the kibosh on the auction, but I would be willing to bet other posters of this will be offered at some time. Note the wording Paul has on the auction, the fact he doesn't tout this as the only one in the collection, and the fact Paul has already offered multiple copies of several items. Still, I bet it would look nice framed on the wall....but there could be more copies to come. If I may also say a few words, if you are buying these you should be buying them for the unique collectibility, not for the possibility of making a mint on resale. So far, items I have seen reselling from Paul's auctions have gone for a fraction of the original price. Being auctioned under the Collector's Trove banner seems to attract larger bids than such items would normally get, especially for more common items. But it doesn't seem to affect what the item will sell for later. " Update: The auctions are over and this poster sold for 1,527.97....! I believe the winner was ScketreWhisp® on the Acaeum. See here. He runs the NTRPGCon and says this poster and others he won (for ~$7700 total) will be framed and on display at the next con. So they are going somewhere useful. A few years ago I picked up a used copy of the Misenchanted Sword by Lawrence Watt-Evans based on my memories of seeing the cover back in the 80s. I enjoyed it and ending up reading the entire series. Sweet illustrated the first five or so. Watt-Evans recently tweeted: "Darrell Sweet has died. In the early years of my career I was a "Darrell Sweet author," and his covers surely sold thousands of my books." "This is the best room in my inn"
In October I wrote up several monster entries based on "lost" monsters found in the module B2, including Warrior Zombie, Giant Rat King, and Phantom Cat. Other "lost" monsters for Holmes Basic can be found right in the Sample Dungeon by Dr. Holmes himself, including a giant snake, giant octopus and an ape, none of which appear in the Monster List in the Blue Book. One that is particularly obscure is the original version of the spider in Room J. This spider lurking under the ruins of the tower of the wizard Zenopus was possibly inspired by the Conan tale The Tower of the Elephant (Robert E. Howard, 1933). In that story a giant spider drops on Conan from the ceiling of a room in the tower of a sorcerer. If you have the 2nd or 3rd edition of the Blue Book, the spider in Room J is named a "giant spider" and essentially matches the entry in the Monster List at page 32: HD 4+4 (21 hp) with a poisonous bite (2-8 points damage). However, it also has an AC 3, which is off by one from the standard AC 4. This is a residual reference to the original version found in the first edition of the Blue Book, which was more ferocious: in addition to the lower AC, it has HD 6 (31 hp) with a poisonous bite (1-8 points damage) that saves at -1 "because it is so strong". Furthermore, the spider was originally referred to as an "enormous spider" rather than a "giant spider". This reflects that the first print of the Blue Book (~mid-'77) did not have a Monster List entry for spider. The entry for "Spider" (including huge, large and giant types) was added to the 2nd edition (Nov '78), and was adapted from the Monster Manual entry (published in Dec '77). OD&D doesn't have a codified entry for Spiders of unusual size. There are Giant Spiders mentioned in the variable damage and wandering monster tables in Greyhawk, but no full entry apart from "Large Insects or Animals" in Monsters & Treasure, which can have HD 2-20, AC 2-8, and damage 2-4 dice. Holmes may have simply picked a set of stats from these loose OD&D guidelines to generate his enormous spider. Wicked old giant spiders that have grown to enormous proportions. Their bite is occasionally less damaging than that of a giant spider, but their poison is worse (-1 on the saving throw dice). Less swift than younger spiders, they favor a silent sneak attack. The spider, concealed in a darkened ceiling area, drops onto an unsuspecting victim. A successful hit roll indicates the victim is knocked down and surprised; the next round the spider has first attack while the victim fights at -2 as they stand up. A missed hit roll indicates the spider lands on ground next to the victim and the fight proceeds normally.